This book is a call to live for what matters forever. It is a challenge to view genuine success, not in terms of earthly acclaim or possessions, but in terms of a "well done" from Jesus. The primary focus of this book is to show readers how to live today "in heaven's honor," focusing on the day when we stand before God at the seat of judgment. A secondary focus will be a biblical theology of heaven with a description of its joys and rewards. This is not a general book about living the Christian life severed from its relation to what happens in eternity. Just as there are levels of anointing and affirmation on Earth, this book shows that there will be levels of anointing and affirmation in heaven. It helps us to see that there is kingdom work to do?that will last forever. 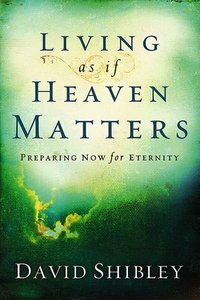 About "Living as If Heaven Matters"
David Shibley is the founder and president of Global Advance, has pastored churches in Arkansas, Oklahoma, and Texas, is the author of over 20 books, and has bachelor degrees from John Brown University, and Southwestern Baptist Theological Seminary.